For the most comprehensive training where you spend the day with a certified Spirit Play trainer and other Spirit Play teachers, it’s best to attend an in-person training. In this full-day training from 9 a.m. to 5 p.m., you will observe stories being told, experience a model classroom, practice with using stories, and the receive a wealth of knowledge brought by the trainer. Shorter workshops are available for tuning up your program. Contact a trainer listed below to schedule your training, or see the list on this page of training hosted by another church that you can attend. If you choose to sponsor a training, you will be responsible for all costs, registration, and logistics. Training classes can hold a maximum of 15 students. If you want to open your training to other churches, you can modify the sample registration form below. The training costs $1,200 plus travel expenses and lunch for the participants if you want to provide that. Of that $1,200, $200 of it is for a deposit once you have booked a date with a trainer. Send the deposit through PayPal to Jennifer Innis at revjinnis@paypal.me. The remaining $1,000 is an honorarium due the day of the training for a 9 a.m. to 5 p.m. training for up to 15 people. There is no discount for fewer participants. The cost of travel expenses includes airfare or mileage, baggage fees, taxi, food, and stay for 2 nights/3 days homestay or hotel as needed by your trainer. Unless otherwise negotiated with your trainer, all airfare and hotel or homestays will be set up and paid for ahead of time by the sponsor. An invoice for the other expenses will be sent after the training. For local driving, the cost is .60 per mile, which includes gasoline. Please check the trainers’ page link above for other requirements. To help pay for the training, typically the church sponsor charges participants enough to cover costs of training or applies for a grant to cover it. Churches usually charge people outside their church about $175 to $200 to cover the training costs if there are airfare and hotel involved. Cancellation fee once the date is reserved: $200. If you reschedule, there is a $100 fee for changing the date unless due to weather or illness of trainer. Please make sure that you have enough interest before scheduling a date to avoid fees. We can also arrange a training midweek, or several evenings in a row to best meet the needs of your church. Get upcoming events, free stories, & more! 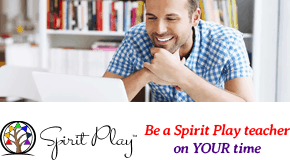 Get Spirit Play updates on your news feed. Time to set up your fall training. Contact a trainer today.